TSRJC Entrance Test 2018 Admit Cards. TSRJC Admission Test 2018 Hall Ticket will be released. TSRJC CET 2018 Exam for admissions into regular Intermediate Courses in Telangana Residential Junior Colleges in TS State for the academic year 2018-19. TSRJC Hall ticket download 2018 will be declared by TSREIS Hyderabad on behalf of Government of Telangana. Availability of Admit card on 1st May 2018 . Hall tickets will not sent by post and E-Mail. Candidates after successful completion of online registration can download hall tickets from official website. 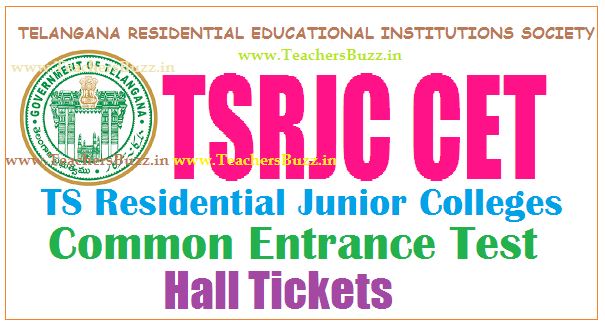 Telangana Residential Educational Institutions Society issued TSRJC Common Entrance Test 2018 Notification on March 16, 2018. TREIS invited online applications from 06-03-2018 to 15-04-2018 from the eligible candidates for admission into Intermediate courses in its TSRS Junior Colleges. The Telangana Residential Educational Institutions Society would be conducting TSRJC CET 2018 on May 12 from 10 am to 12:30 pm for admission of students into 1st year Intermediate for the year 2018-19. The examination would be conducted at two general and two minority colleges in the State. Telangana State Residential Junior Colleges Common Entrance Test 2018 will be conducted by TSREIS, Hyderabad will be announced the hall tickets of entrance exam. Candidates must keep ready the login information such as registration id and date of birth of candidate. The registered candidates were already allotted in examination centres throughout the State. Candidates should report at the respective centre by 12-05-2018@ 9.30 am with the necessary stationery and their hall tickets. Candidates can download their Hall Tickets from the website at http://tsrjdc.cgg.gov.in/ or http://tresidential.cgg.gov.in/default.aspx from 01.05.2018 to 12.05.2018 with the reference number allotted to them. 6. Remember to carry it on May 12.